In case it's not stated in the description, do ask us. We guarantee that your issue will be solved quickly. We usually respond within 24 hours on weekdays. Proxicast's 24 easy-to-install permanent mount omni-directional antenna improves transmit and receive signals for all 3G and 4G/LTE, xLTE, AWS frequencies on Verizon, AT&T, Sprint, T-Mobile, US Cellular, Bell Mobility, Rogers, Telus, Sasktel, Telcel, Movistar, Digicel, IUSACELL and many other cellular operators worldwide. 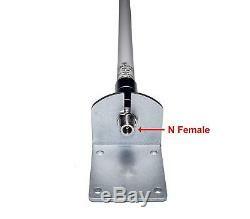 This antenna is also suitable for unlicensed 900 MHz (ISM) radio applications and 2.4 GHz WiFi / ISM band and GPS use. The omni-directional design provides high gain without the cellular tower location and alignment hassles of directional antennas. Its compact size and gloss white finish blend into any environment and make it ideal for many outdoor applications, including building rooftops, utility poles, surveillance trailers, well sites, remote telemetry units, meters, homes and offices. With the appropriate adapter cable (not included), this antenna is compatible with USB cellular modems and Mi-Fi Hotspots, external 3G/4G cellular modems, routers and signal amplifiers from companies such as CalAmp, Cisco, Cradlepoint, Digi, MoFi, Netgear, Novatel, Pepwave, Proxicast, Sierra Wireless, SureCall, weBoost/Wilson and ZTE. 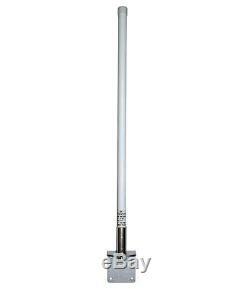 Specifications Frequency Range: 698 - 2700 MHz Gain: 10 dBi Radiation: Omni Polarization: Vertical Impedance: 50 ohms Connector: N Female - bottom integrated Material: Fiberglass & Stainless Steel - White UV stable poly-urethane coating Height: 23.6 inches (600 mm) Mount: Pole/wall (bracket and 2 inch diameter U-bolts included). Requires a direct coaxial wired connection to an existing modem, router, amplifier/booster. WILL NOT boost reception of cell phones - they require a powered booster/amplifier. Is this compatible with my device? 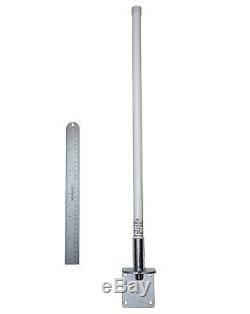 Note: Use our XBOOM cross-over bracket (ASIN B079WTQ4CM) to install 2 identical antennas separated by at least 22 inches for best LTE MIMO results. IMPROVES SIGNAL STRENGTH & SPEED on Verizon, AT&T, Sprint, T-Mobile, Telus, Bell Canada, Rogers, DigiCel and all 2G 3G 4G LTE xLTE AWS GSM CDMA cellular broadband services - COMPATIBLE WITH routers, modems & gateways from CalAmp, Cisco, Cradlepoint, Digi, MoFi, Netgear, Novatel, Pepwave, Proxicast, Sierra Wireless, SureCall, weBoost, Wilson, ZTE and many others - INTEGRATED FEMALE N CONNECTOR - No additional ground plane needed - WEATHER RESISTANT sleek high gloss white urethane and fiberglass finish. Does not improve signal for cell phones or other devices not directly wired to the antenna. 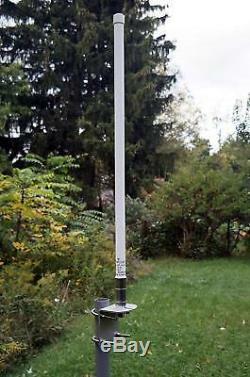 Proxicast 10 dBi 3G/4G/LTE High Gain Omni-Directional Fixed Mount Outdoor for. The item "Proxicast 10 dBi 3G/4G/LTE High Gain Omni-Directional Fixed Mount Outdoor for" is in sale since Wednesday, August 22, 2018. This item is in the category "Computers/Tablets & Networking\Enterprise Networking, Servers\Directional Antennas". The seller is "bestbooks613" and is located in Chicago, Illinois. This item can be shipped to United States.